So Don is playing in Steven's yard, and for whatever reason that's driven Steven to play in my yard, so now it's time for me to play in Steven's yard, except it's not quite what he usually has in his yard, so it's more like I'm playing in the creepy shed in the corner of his yard. Or some other yard-based metaphor that hasn't come to mind yet, your choice. Anyway... behold! Okay, they aren't red, but this is from Hatsukoi Limited, a series that aired in 2009, long before the current fad became a thing. These... these are practically ur-red-half-frame-glasses! Revel in this discovery, Steven, you seeker of special spectacles, for they may have been the harbinger of greater things! Not that this isn't pretty great. 1 Nodoka from K-On!, also 2009. 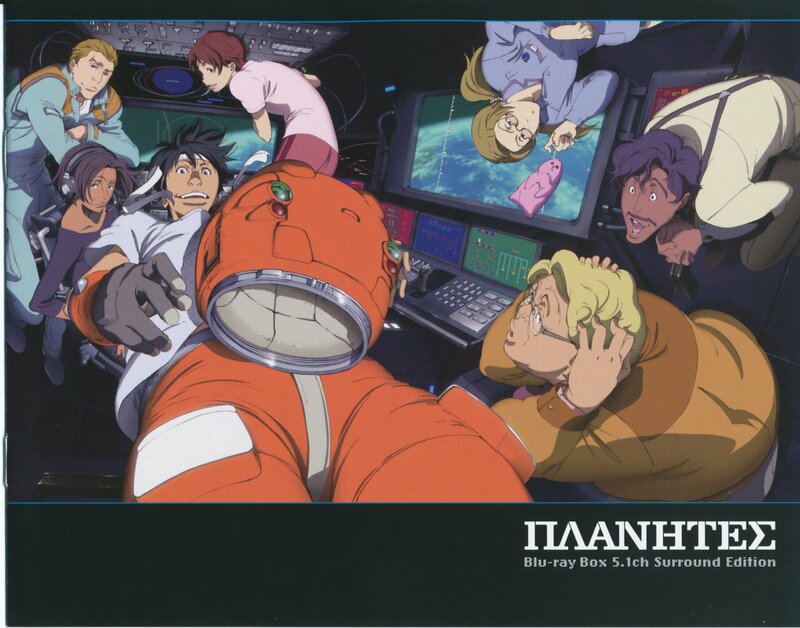 2 Also, Edelgard Rivera (top, upside down) from Planetes sported red half-rimmed glasses way back in 2003! 3 Link fail, FDM... and tell Steven, not me! 4 By the way, I would think it's safe to assume you already have the rather excited duck I recently saw in Index. 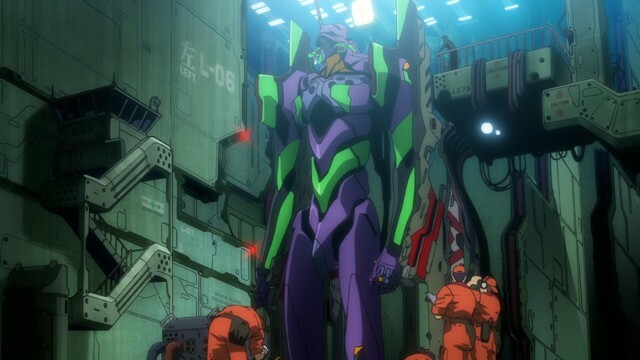 A little over a month ago, I released the first part of the writeup for the first of the new Evangelion movies. For a while there, I wasn't altogether sure there'd be a second part... this may come as a surprise to many of my readers, but these writeups often aren't the most fun things in the world to work on! I'm sure you're shocked by this revelation, but it's really honestly true! I mean, let's face it... it's not like the series I do writeups for are the best ever. Then you get nominally good shows, like this one, that are sometimes unjustly lionized for their depth and subtle character analysis, when in fact they're just giant robot shows. I exaggerate for effect in the case of Evangelion, but nobody who has seen the actual TV series can legitimately argue that, at its core, Gainax was just throwing crap at a wall to make pretty pictures. Sometimes it stuck, sometimes it didn't, sometimes it hit walls in other rooms altogether. In some ways, the movies improved on this technique so at least they're consistently hitting the wall. That's a plus. ...or from the pr0n version of Tron, one of the two. 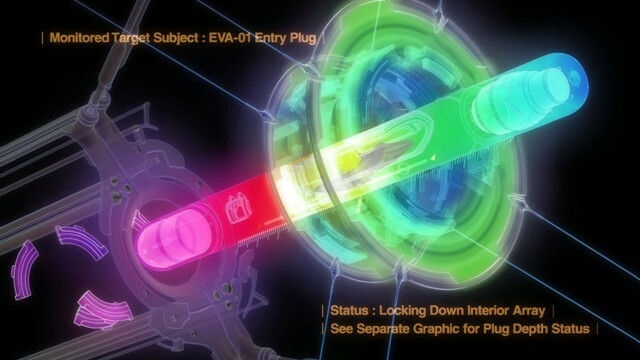 No, nothing phallic about the "Entry Plug" the pilot rides in, or that there's a graphic for "Plug Depth Status." 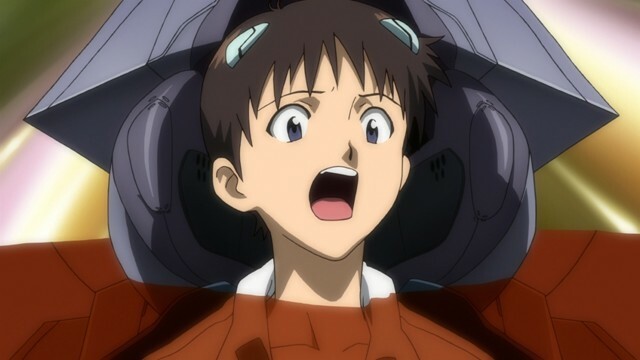 Nope... it gets worse when you realize (in the show at least) that the Evas are inhabited by the souls of the pilot's mothers. Here, let me just stick two large pins into my eyeballs now. I'm also not going to say anything about how, once the Entry Plug has reached maximum Depth Status and is fully seated, it begins to fill up with a sticky liquid called LCL. I'm not going to say anything about it because I'm not as perverted as I seem to be... I'm fond of not plucking my eyes out of their sockets. Though if I did, I could stop watching crappy anime and occasionally blogging about it for your enjoyment. Libbets and Bunnymen, I present to you Unit-01 in all of its purple and green glory. Looks kinda like a walking bruise, actually. Well, standing bruise, as it hasn't actually moved on its own yet. Like the Space Shuttle being taken to the launch tower, Unit-01 is loaded onto a platform under a tube that leads to the surface. The command is given, and vwoosh! Up the tube it goes, propelled by the power of ELECTRICITY! HUZZAH!!! This may not be the most subtle sallyport ever, seeing how the act of opening is accompanied by blaring klaxons, flashing lights and a massive rumbling sound as Unit-01 is propelled by the power of ELECTRICITY! HUZZAH!!! to face the Alone Angel. Stealth is, apparently, not an issue. 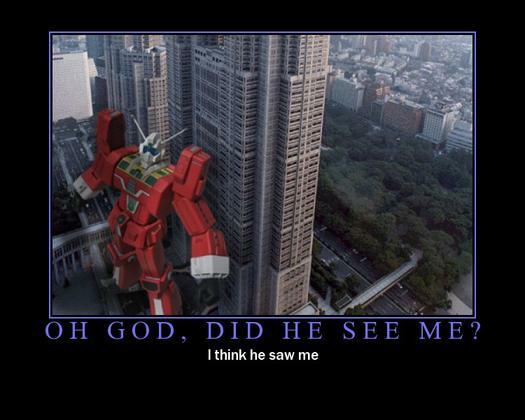 Which makes sense; we are talking about giant robots here... to them, stealth is hiding behind a skyscraper going "oh god, did he see me?" Post contains 1873 words, total size 15 kb. 1 It sure is CONVEEENIENT that the angels always attack so close to the Launch Port, isn't it? 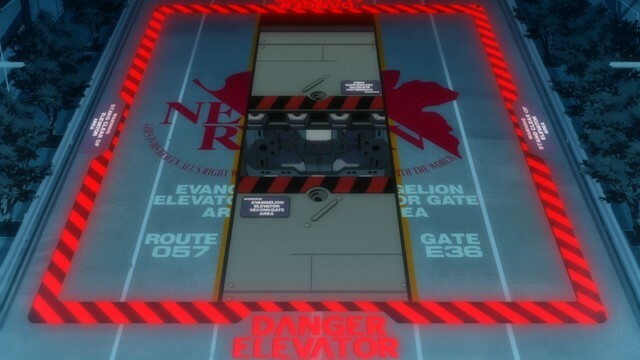 2 Because NERV only has one? The entire city of Tokyo-3 is designed to fight Angels... I think they have multiple sallyports around the city. 3 Mauser, that's explained and it makes sense. 4 You think that's my chest? 6 Mauser, they kinda already did. Vauc... dude. No. 7 The angels aren't actually very smart. Lilith, Angel #2, is being kept beneath Tokyo 3. The angels are drawn to her for some reason, possibly trying to rescue her. There doesn't seem to be any strategy involved; they just show up and attack, trying to get down to where she is. The final angel, the very last one, is much more intelligent than any of the previous ones, though, and he actually does get into the area where Lilith is stored. 8 Steven, that's in the TV series. Things can be (and are!) substantially different in the movies. Just because this one follows the first six episodes fairly closely doesn't mean the rest do... and in fact, they don't. 9 When working on RahXephon, we were at one point confronted with the use of the word "sousha", meaning "the player of an instrument" (but with a different connotation than "musician", apparently). The word was going to turn up often and so we needed something short to pop in there, but having the main character called a "player" during all sorts of serious/ominous scenes tripped my Don't Make Them Laugh When It's Not Funny alarm. 30kb generated in CPU 0.04, elapsed 0.1688 seconds. 46 queries taking 0.1416 seconds, 225 records returned.